"Gestas" redirects here. For the French commune, see Gestas, Pyrénées-Atlantiques. Crucifixion by Hans von Tübingen showing the good thief on Christ's right (the left of the picture), and the impenitent thief on Christ's left with a devil. Others portrayed are the Blessed Virgin Mary, Saint John, and the three Marys (Mary Cleophas, Mary Salome and Mary Magdalene). The impenitent thief is a character described in the New Testament account of the Crucifixion of Jesus. In the Gospel narrative, two criminal bandits are crucified alongside Jesus. In the gospels of Mark and Matthew, they join the crowd in mocking him. In the version of the Gospel of Luke, however, one taunts Jesus about not saving himself, while the other (known as the penitent thief) asks for mercy. In apocryphal writings, the impenitent thief is given the name Gestas, which first appears in the Gospel of Nicodemus, while his companion is called Dismas. 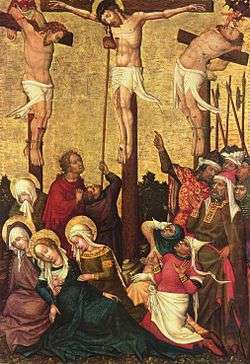 Pious folk beliefs later embellished that Gestas was on the cross to the left of Jesus and Dismas was on the cross to the right of Jesus. In Jacobus de Voragine's Golden Legend, the name of the impenitent thief is given as Gesmas. The impenitent thief is sometimes referred to as the "bad thief" in contrast to the good thief. The apocryphal Arabic Infancy Gospel refers to Gestas and Dismas as Dumachus and Titus, respectively. According to tradition - seen, for instance, in Henry Wadsworth Longfellow's The Golden Legend - Dumachus was one of a band of robbers who attacked Saint Joseph and the Holy Family on their Flight into Egypt. In the Gospel of Luke version however,  the details are varied: one of the bandits rebukes the other for mocking Jesus, and asks Jesus to remember him "when you come into your kingdom". Jesus replies by promising him that he would be with him the same day in Paradise. (Luke 23:33-45) Tradition has given this bandit the name of the penitent thief, and the other the impenitent thief. Among Filipino Catholics, the name is popularly exclaimed as Hudas, Barabas, Hestas!, a term invoked as an exclamation of disappointment or chastisement, mentioning Gestas along with two other individuals Judas Iscariot and Barabbas, which gained prominence in the 1973 Filipino television series John En Marsha (1973-1990), starring actor Dolphy and actress Nida Blanca. Wikimedia Commons has media related to Gestas. ↑ Harrington (1991), p. 8. ↑ Davies (2004), p. xii.